This recipe is so good I had to publish it again! 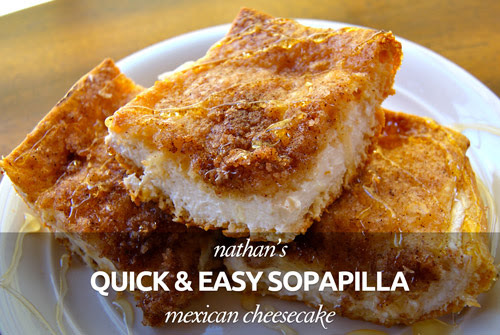 Last year I wrote a post about a dessert called Sopapilla, or “Mexican Cheesecake,” as it’s sometimes called. Readers tried the recipe and loved it, so I decided I should share it again. Everyone who tries it loves it. This is the fail-proof dessert that Daniel and I bring to parties and it’s always the first dessert to disappear. Can’t you just smell the freshly baked cream cheese, cinnamon, and honey? The recipe serves 12, but for larger groups, we cut it into 24 smaller squares. Replace the standard cinnamon topping with 1 tsp of pumpkin pie spice. As of 2016, this recipe has been pinned over 31,000 times! Thanks for all the Pinterest love. It’s come to my attention that canned crescent rolls are not as common in some countries and visitors have asked for alternatives. Let me start by providing a link to the most common option here in the U.S., from Pillsbury: http://www.pillsbury.com/products/crescents/reduced-fat-crescents. That link will give you a visual and also ingredient information so you can compare. It’s a pre-made dough that comes rolled in a can, and when opened, it’s easy to spread out and bake with. I’ve heard that puff pastry is probably the closest alternative, but I haven’t tried it. If you have any suggestions for substitutes, please let me know. i made this for my class project &everyone loved it, there asking me to make it as xmas gifts! I have made this several times and is a hit always! thank you for something new and different to serve to company! This is absolutey wonderful and easy! Thanks! 2 8 oz. cans of crescent rolls. my question is WHAT exactly are crescent rolls that would come in a can. I can only think of the ones from the bakery?????? Hi Dawn, these are something that are sold by a company called Pillsbury here in the U.S. It’s a pre-made dough, rolled into a can, that you can just pop open and bake. It’s not healthy, but it’s convenient and cheap to find in our stores. Unfortunately I don’t think they’re sold in Australia. An equivalent might be something like puff pastries or croissants? Here’s a link to their site to give you some info to compare: http://www.pillsbury.com/products/crescents/reduced-fat-crescents. I hope you’re able to find a delicious alternative. Please let me know how it turns out. Curious why you use fat-free cream cheese? I’ve always tried to shy away from FF when baking. Hi Amber, it’s just a personal preference. But it can certainly be made with the regular cream cheese if you prefer. So you don’t need eggs for this amazing-looking cheesecake? Hi RHLady, nope, no eggs. 🙂 Let me know if you try the recipe. I’m curious to hear if you like it. Can you make the night before? Do you store it overnight in the refrigerator or on the counter? Do you serve hot, cold, or room temperature? Thanks!! Hi Kim, these are good questions because I know that traditional cheesecake is refrigerated and served cold. But this is the opposite; it tastes best when it’s hot or at least warm. It has a soft, gooey consistency that way. I’ve had it at room-temperature and it was still very good. I wouldn’t recommend leaving it out on the counter for more than a couple of hours due to the cream cheese. But yeah, you could make it the night before and store it in the fridge, then just heat it up the next day to serve. I think it would be fine. Please let me know if you try it. I have been making these since 1996 w/a slight variation. Always a hit! I can see why it’s been a staple of yours for 20 years! It really is popular. What is your variation?